A new card set for Pretty Good Solitaire is now available. The Science Fiction Card Set features images with science fiction themes on the cards. The Science Fiction Card set can be downloaded from <http://www.goodsol.com/pgs/cardsets.html>. The Science Fiction Card Set is for Pretty Good Solitaire version 8 or higher, FreeCell Wizard version 3 or higher, Spider Wizard version 2, or Action Solitaire. We've partnered with our friends at DreamQuest Software to offer you a free game! During November, you will get a copy of DreamQuest's Championship Gin Pro absolutely free when you purchase Pretty Good Solitaire, Pretty Good MahJongg, or Action Solitaire. That's a $24.95 value, two games for the price of one! Whether you're an expert or a beginner, Championship Gin Pro is sure to please. Packed with the most features available, this game will improve your skills while you challenge it's playful characters. Features include free online play at DQZone.com, eight computer personalities that taunt and adapt to your play style, five difficulty levels, an interactive Gin tutorial & practice options, trackable game statistics, and more! Offer ends December 3rd. After you order, your registration code email will have the details on how to get your free game. And note that even if you buy Pretty Good MahJongg before version 2.0 is released later this month, the upgrade to version 2.0 will be free. 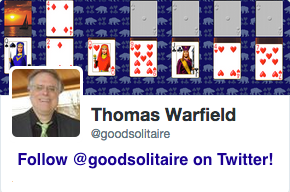 The Pretty Good Solitaire Gift CD is once again available for the holiday season. This CD-ROM contains the latest version of Pretty Good Solitaire with a full registration. A great gift for family and friends, and it has special prices for multiple copies. The price is $31.95 for 1 copy, with multiple copy discounts available. This price includes shipping to anywhere in the world and individual gift-wrapping (by Anne) for each copy. 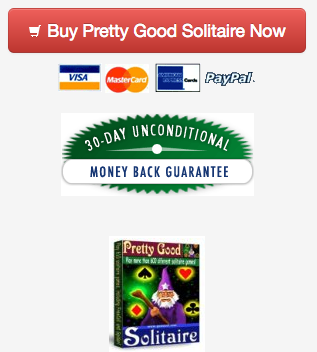 Each copy can be branded with the name of the recipient, if known, which will allow the recipient to be eligible for free upgrades through the 2007 version of Pretty Good Solitaire. Order by secure server from <https://www.regnow.com/softsell/nph-softsell.cgi?i tem=1505-17> or go to <http://www.goodsol.com/orderonline.html> for more information and ordering options. In the next newsletter we will announce a major update to our MahJongg solitaire game, Pretty Good MahJongg. Pretty Good MahJongg contains many solitaire games that are played with MahJongg tiles instead of playing cards. The most well known and popular MahJongg solitaire game is called tile matching. It is a fairly simple game to learn and is easy to play, but it can be hard to win. At the beginning of the game, a number of MahJongg tiles are set out in a pattern, called a layout. There are usually 144 tiles in a layout, although it can be fewer or more. The layout of tiles can take any shape. In the current version of Pretty Good MahJongg, there are 34 different layouts. In the upcoming new version, there will be well over 100. My favorite layout in the current version is called "Taiwan". The object of the game is to remove the tiles in pairs until you clear the layout and remove all the tiles. Remove pairs of available tiles that have the same pattern on them. These are called matching tiles (this is why it is called tile matching). A tile is available if there is no tile adjacent to it on either its left or right (long) side. If a tile is stacked on top of other tiles, it is available only if there are no other tiles adjacent to its left or right side (long sides) on the same level. The best strategy is to try to remove tiles on the outside or top levels of the layout first. This will generally make more tiles available for further play. Usually the best move is to remove the pair that creates the most new pairs of matches. The status bar at the bottom of the screen tells you how many available tile matches there are. The best move is usually the one that will actually increase this number rather than decrease it. Often, of course, you have no choice but to remove a pair that won't increase the number of available matches. When the number of matches gets down to only 1 or 2, you are in trouble. If you run out of available matches and there are still tiles remaining, you have lost. Tile matching is one of the many types of games in Pretty Good MahJongg at <http://www.goodmj.com>. Later this month, we will release a major new version 2.0 of Pretty Good MahJongg. For a preview of some of the new games and features in version 2.0 of Pretty Good MahJongg, see <http://www.goodmj.com/preview.html>.